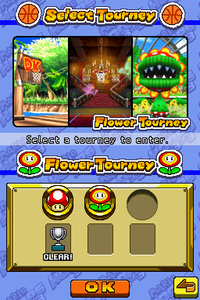 The Flower Tourney is the second tournament in Mario Hoops 3-on-3. It can be unlocked by completing Mushroom Tourney. The tournament is played on DK Cruiser, Luigi Mansion, Daisy Garden and in exhibition mode only, Malboro Garden. There are two difficulties of the Flower Tourney; normal and hard. In each one, the prize can be either bronze, silver, or gold. Clearing normal Flower Tourney unlocks Star Tourney. Dixie Kong – Complete normal Flower Tourney with a bronze prize or higher. Daisy alternate costume – Complete normal Flower Tourney with a silver prize or higher. Watermelon Ball – Complete normal Flower Tourney with a gold prize. Malboro Garden – Dunk 3 times in the last court of Flower Cup (Daisy Garden) and obtain a blue seed from the ? Panel that appears. Boo – Complete hard Flower Tourney with a bronze prize or higher. Yoshi alternate costume – Complete hard Flower Tourney with a silver prize or higher. Dice Ball – Complete hard Flower Tourney with a gold prize. This page was last edited on March 28, 2018, at 12:09.